The Breitling Watch Source Forums • View topic - 810 Dial Print Question -- Redial? 810 Dial Print Question -- Redial? Post subject: Re: 810 Dial Print Question -- Redial? the ref 814 & 815 are in my opinion not a Top Time ? 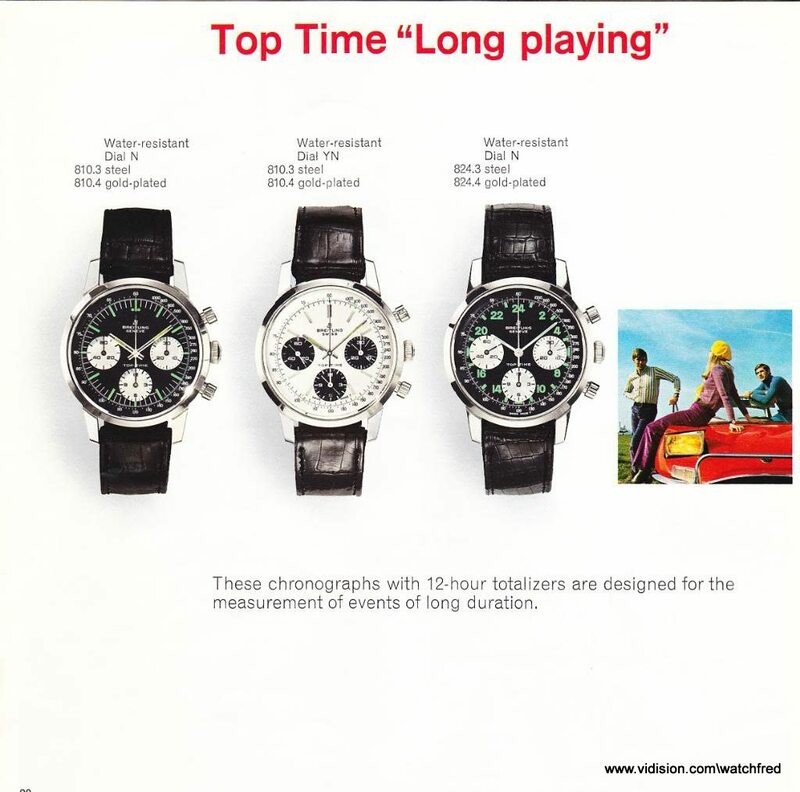 815 are not Toptime - neither on the dial nor described as such in any advertisement or catalog. 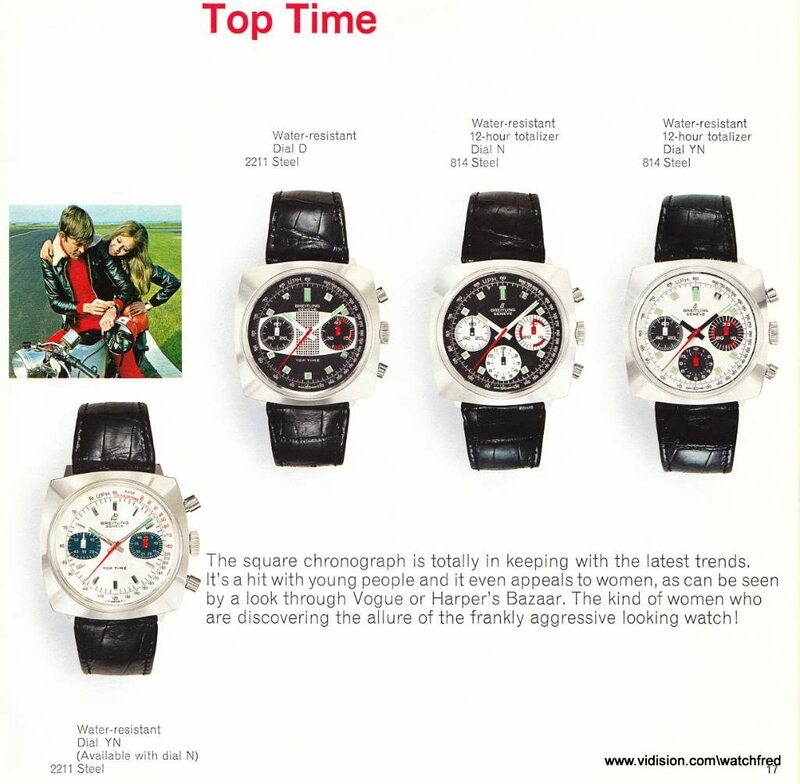 814 according to the Breitling catalog was a member of the Toptime range, although the name does not appear on the dial. 810Mk2 & 824 were described as "Top Time Long Playing" btw. 814 was one of the very early watches in the series going back to 1965-1966 and it was sold for a few years before they made the long playing mainspring. Therefore, to avoid confusion, they didn't call 814 a long playing after installing the new mainspring in early 70's and later. By the way, I had never seen a 814 with a Valjoux 7736 until your post recently. Elgin used the 3 register dial from 814 with Valjoux 7736 but I wasn't aware of Breitling doing that. Ah that is interesting, thanks. For me always a bit of a guessing game when a watch was launched. I was not able to find 814 with Valjoux 7736, but looking at the the quite late serial number and the fact that other Breitlings models around the same time also had the 7736 replacing the Venus, seemed logical. But i dont have hard (catalog or factory production) evidence, so theoretically could be a project. This is my 815 LP. Is there a steel bracelet that fits with Endlinks on this case? Would like to wear it with steel bracelet. It did not come on a steel bracelet, but there's no reason you can't put one on. As there is no "correct" one, you can add what you like. I don't understand the question. There are no proper bracelets, so no proper endlinks. I think most people would not use endlinks anyway.